I see you eyeing her. You know who I’m talking about – the woman sporting the baby bump with 7 kids trailing her. She’s not trying to make a scene; in fact, she’s trying her best to be as “normal” as possible so that she doesn’t draw attention to herself and her larger than normal family. But she knows you see her. Most people watch her our of awe and curiosity wondering, How does she do it all? There’s a handful, though, who look on in disgust thinking, Doesn’t she know what causes that? She knows you are watching her whether out of awe or disdain, curiosity or scrutiny. Her back feels the stares, and sometimes she catches bits of whispered conversation. I know because I’m that woman; I’ve felt and heard it all. It’s my life. While sometimes the negative is tough to take, I’ve been encouraged by the smiles and “great job, Mama” pats on the back. I don’t mind curious looks and surprised smiles. In fact, those are welcomed breaths of fresh air because they aren’t judgmental at all, just…curious and innocent. So for those curiously wondering, How in the world does she do it?, this is for you–everything you want to know about large family living! # 1: Have you always wanted a large family? Nope. Never in a million, well…maybe a million, years would I have dreamed I’d have 7 kids. I thought I might have three or four, not seven going on eight. It was a change of heart, a working of the Holy Spirit who brought about the change in my attitude towards having a large family. It was He who caused me to even consider having more than 3 or 4 kids. #2 : I can’t handle my two (or whatever number), how do you do it? Truthfully, I have no idea. It’s often a moment by moment thing. Taking one thing at a time, praying under my breath, trying not to say the snarky words on the tip of my tongue. And when I do let those words fly, it’s apologizing and moving on. It’s crazy, chaotic, and loud sometimes. 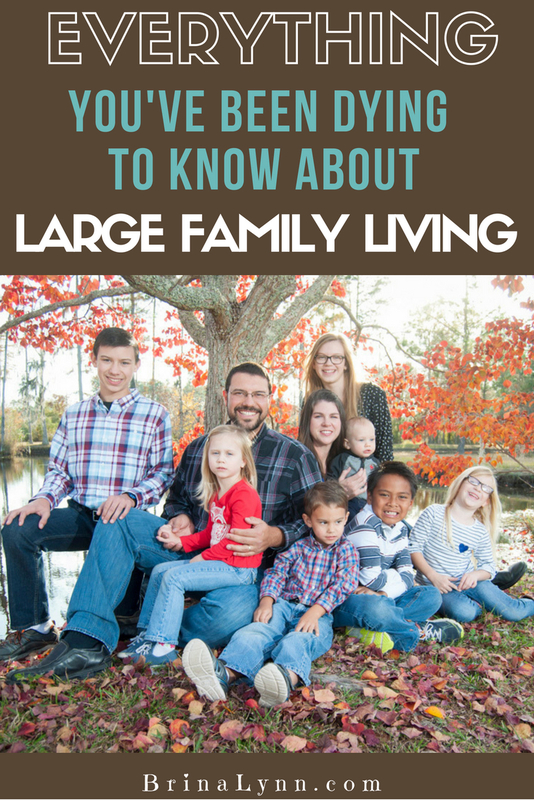 If you missed this post, go back and take a look at what it’s like living in a large family. Honestly, it’s the grace of a loving God, moving me from one moment to the next. Just this week I was talking to another large family mama, and in response to my comment about being *this* close to the edge she said, “I always feel like I’m there. I’m holding on by my teeth and the Holy Spirit. He keeps me there.” We laughed and moved on in the conversation, but it’s true. In and of ourselves, we can’t do it! Another thing is that we work together. I don’t do it all by myself; there’s no way I could physically do all that needs doing on a daily basis by myself. That’s too many dishes and little people to wash, too much laundry to muddle through, and too many toys to pick up all while making sure people actually get fed, oh and educated. # 3 How do you afford so many kids? I’m not sure people really want to know the answer to this one, but here it is. Sacrifice. Bottom line. We drive older vehicles so that we don’t have car payments. Our house is older and small because we don’t want to be bound to an overwhelming mortgage for years on end. And our kids wear hand-me-downs and consignment store finds as much as possible. When that’s not an option, we shop smart–catching sales, using coupons, Old Navy (need I say more? ), and buying brands like Garanimals and Okie Dokie for the little ones. Christmas looks far different for us than it used to. We set a budget, and we stick to it. No longer do we buy without a very clear plan, keeping money (and space) in mind. We stick to a budget and don’t spend more than we have. It’s been a long and often difficult journey to get to the place we are financially, where we feel freedom from debt despite our super-sized family! Check out my series on budgeting, saving money, and cutting back. We kind of don’t have a choice because if we go over our allotted amount for groceries, it has to come from some other bucket, or envelope as the case may be. Yes, we use the envelope system as recommended by Dave Ramsey. It’s an incentive to stick to the budget. I learned so much when I did the Grocery Budget Makeover. I’m not exaggerating when I tell you that I have consistently saved $150 a month on groceries since going through the makeover! However, it boils down to meal planning, shopping the sales, and avoiding convenience foods. I tend to save the most money when I meal plan and shop weekly according to the sales. Also, avoiding convenience foods is a big money saver. I don’t often buy pop tarts or packaged cookies. We omit things like pop tarts and we bake cookies usually once a week. I also make pancake and muffins from scratch–I promise it’s not as scary as it sounds! # 5 Do you homeschool ALL of them? Yes, the school-aged ones I do, so that’s all but one. Without a doubt, keeping him entertained and out of mischief is just as hard as trying to teach the four that sit at the table with me. My older kids are very helpful with keeping him corralled at various times of day. They are also very independent in their school work. Each week I give them their assignments, and they work through, coming to me when they need me. Teaching little people is much more involved, as I have to sit with them to be sure they understand and to keep them on track. I admit, at times it’s almost more than I can do. When it gets to that point, we do something else–RECESS! # 6 So…is this it? I can’t answer question with complete confidence. Every time I say, “yes!” the Lord laughs and sends another one. So, my answer is this: We are open to whatever the Lord has in store for us. The selfish part of me wants to say, “I’m done,” simply because I’m old and worn out, and I’ve had probably more than too many c-sections. However, I trust that God has what’s best for us, and only He knows when we are done. Some would argue that we could control that. Yes, to an extent we could, but only to the point God Himself allows us to. I have friends who have conceived while on birth control and ones who have conceived after their husbands have had a vasectomy. On the other hand, when I think of trying to write my own story, which ones of these treasures could I have said no to? Which ones would my life be complete without? I can’t nor do I want to answer those questions. # 7 How do you spend quality time with each of them? Truthfully, we are not good at taking each kid “out” for their own private mama or daddy time. It doesn’t work for our budget. However, we do take time with each of them. This morning, Nan and I sat on the porch and just talked–just us. Lately, Chris has been taking the little ones, one at a time for a fishing trip in the kayak. Sometimes it’s snuggling on the couch or chatting on the swing. Often it’s grocery shopping and a treat. Other times it’s helping with kitchen chores after the little ones are in bed. Don’t believe that just because you haven’t made an effort to have a formal outing that you haven’t spent quality time with each child. And sometimes quality time isn’t one on one time at all; it’s all of us being together, freely talking and laughing, just enjoying one another. # 8 How do you get to enjoy coffee while it is still hot the first time? One friend piped up and said, “You mean coffee is meant to be drank hot?” We laugh, but it’s true. How often after the kids get up do you get to enjoy hot coffee? Not very. What do I do? I get up earlier than the kids, take my coffee and my Bible and sneak out onto the porch. If it’s too cold or rainy, I turn my rocking chair to face the window, and have my Jesus and coffee time there. Hot coffee and Jesus. That’s a priority! More of your questions answered next week! You guys were so amazing and so sweet in responding when I asked on my Facebook page what questions you wanted answered! That means I’ll be doing a series of posts full of your questions so that I can get to them all and not bog you down with one long monster post. So, check back next week for 8 MORE questions to answer everything you’ve been dying to know about large family living! Also, if I didn’t answer your question today, and I didn’t reply to you on Facebook, please drop your questions in the comments! We are all curious by nature about things that we aren’t experiencing ourselves and this was SO interesting for those of us that don’t have large families. Thanks for your grace and transparency in sharing what really goes on. Love it! Dearest Brina, I raised 5 kids and am now an empty nester. I remember the days when I got those looks walking through the store. But usually I left the kids home with dad so I could have a few moments alone! I empathized with everything you have talked about here and just wanted to let you know it does end one day and you and your husband can rest and look at those now-adults and see how wonderful they turned out! God bless you.